Arrive Tbilisi International Airport on airline of choice. Travelers will be met by staff of the American Georgian Travel Group and driven to a four star hotel. The distance is approximately 20km (12 miles) and approximate drive time is 25 minutes. This first day is used to adjust to the new time zone and surroundings. B, L, D.
The day starts with breakfast at hotel and then a departure for tours of Mtskheta, the old capital city, and then Old and New Tbilisi. A 15 passenger Mercedes mini-bus is used during the tour. The "Historical Monuments of Mtskheta" became a UNESCO World Heritage Site in 1994; visit the Svetitskhoveli Cathedral (11th century) and the Jvari Monastery (6th century). In Tbilisi, a tour of the Georgian National Museum is included. After the museum, return to the hotel, followed by dinner at the Black Lion Restaurant hosted by AGTG. The Black Lion will introduce Georgian wines. B, L, D.
Breakfast and checkout. Depart for Sighnaghi Eastern Georgia’s Wine Country for two guided tours. The distance is approximate 118 km (73 miles) and passes many road side ovens where bread is baked. Visit Bodbe Monastery and the resting place of St. Nino, the Christianizer of Georgia who came to Georgia in the first part of the 4th C. After visiting the Monastery, a short drive to the town of Sighnaghi. View the scenic Alazani Valley, the Greater Caucasus Ridge, and a 18th C wall that surrounds Sighnaghi (UNESCO protected site), built to protect the town from invaders. Visit Pheasant’s Tears Wine Cellar for a traditional Georgian lunch and wine tasting. Relax, and enjoy the best of seasonal foods and wine tasting while listening to the Ensemble Zedashe perform traditional folk music. Have dinner at a local restaurant and overnight in this memorable town. B, L, D.
After breakfast, begin a tour of wineries in the Kakheti region to see wine production and taste many different varieties of award winning wines; visit the "Khareba", “Kindzmaraulis Marani”, and the “Bagrationi & Eniseli” wineries. Lunch will be served while tasting wines. Visit the Gremi Monastery while driving between wineries. Arrive at the Lopota Spa and Resort for dinner and an evening of relaxation. After breakfast, wineries in the Kakheti region. First stop, "Alaverdi" Monastery and winery, owned and operated by Orthodox Christian monks. A drive through several villages is made to arrive at the "House of Chavchavadze", which is both a museum and vineyard. 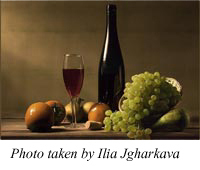 A wine tasting will be followed by lunch near Telavi. After lunch, travel a few miles west of Telavi to arrive at the “Chateau Mere” and take in the spectacular view over the Turdo River looking north to the Greater Caucasus Mountains. Check in, relax…dinner is followed by a relaxing evening. B, L, D.
Breakfast at the hotel and depart for Tbilisi. Time to experience "Old Tbilisi" and the link between Old and New Tbilisi. Following a walking tour of Old Tbilisi and lunch, check into the hotel. Refresh…and in the early evening, depart the hotel for a farewell dinner with traditional Georgian singing and dancing performed at, “In the Shadow of Metekhi” restaurant located on the cliffs of the Mtkvari River in Tbilisi. Return to the hotel to rest and prepare for leaving Georgia. B, L, D.
Depart the hotel early (between 1:00 AM and 1:30 AM) for the airport. Most international flights leave between 4:00AM and 5:00 AM. Kindly note that 18 persons (double occupancy) is the maximum size of the group.